When he started his Savile Row tailor's shop in 1992, Richard James was dubbed the first of the 'new bespoke' - a breath of fresh, colourful air in the exclusive and stuffy sartorial world. More than a decade later and now a firm favourite, his A/W 2014 show at BMW's Park Lane showroom was an ode to the New Edwardians, a 1950's phenomenon attributed to Savile Row and denoted by slim tailoring, lashings of velvet and fearless colour exploration. James' interpretation was a lively offering of relaxed dandyisms - open collars worn with a silk kerchief for example, or the pop of a claret silk waistcoat beneath a chocolate wool coat. 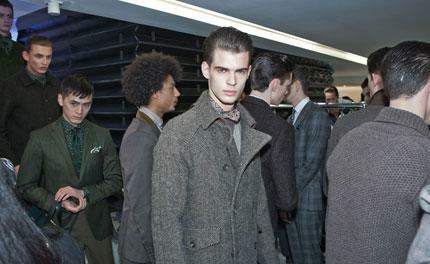 Elsewhere, single-breasted suiting in powdery checks was interspersed with rich corduroys and pops of chartreuse velvet, forest green loden and Harris Tweed hunting jackets, for a textured and eclectic proposition that fused town and country for an off-duty, individual elegance.